If you are the one who is looking for a standing desk that would be the best value for the money you invest, then undoubtedly you can go with the Jarvis Standing Desk! The desk is well made and developed with solid construction; you can easily adjust the standing desk with the help of the electric motor indulged within. Stylish in appearance, you can get this product with 100 % satisfaction as they are developed from the reputed company and the manufacturer also provides the solid warranty for this specific standing desk. 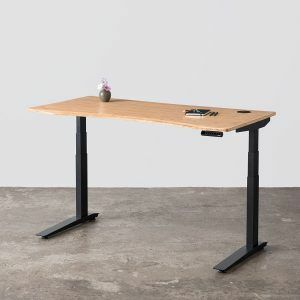 The starting price of the Jarvis Standing Desk is about $445, which is considered to be the top quality and the lowest price range desk among the other product we have reviewed still now. Before we start with the complete review on the Jarvis Standing Desk, let’s check out the advantages and disadvantages so that you guys can get a clear idea on the topic. Built with maximum stability, the lift capacity is about 350 lbs which is reliably large, well built, beautiful and stylish look, extraordinary tabletop construction with an attractive look, good adjustment speed, capable of accommodating users up to 6 foot and 6 inches, includes more number of customizable options and the manufacturer offers free shipping to your doorsteps. Not much drawbacks, but there are few negatives indulged within this standing desk too. Lacks a little bit back in the cable management, makes sound and therefore sometime provides a irritating feel for the users. There are chances for the desk to arrive in various shipments which will be not comfortable for the users. There are many unique features indulged in this standing desk, this is the reason why people prefer to choose this Jarvis Standing Desk. Let’s have a full review about the desk below in depth. Assembling the product is not much hard if you follow the instruction properly as per the user manual. It may take one or two hours to set up, you can use the electric drill for fitting the screws and therefore you can save your assembly time. You will get the product in two packages and there are high chances for the package to be delivered at two different times. The manufacturer provides 7 years warranty on the motor, frame and for the moving parts. If you are not satisfied and going to return the standing desk, make sure you are returning it on the same new condition with its original packing. In the case of wrong package or damaged pieced, you need to pay a restocking fee. 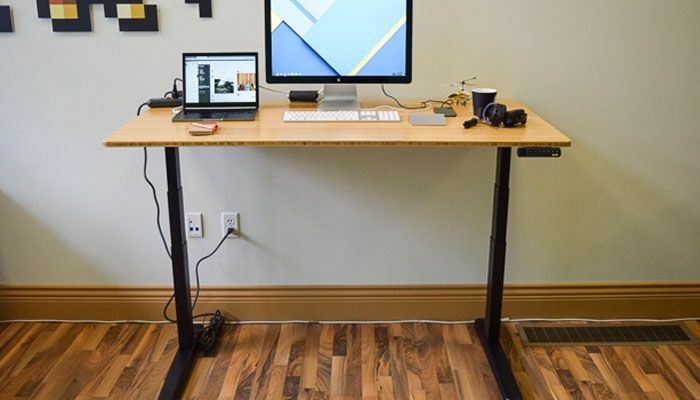 If you are getting the product for holding a lot of stuff, then this standing desk is a beast in it as it can hold a maximum weight capacity of 350 lbs, the desk can be raised and lowered at 1.25” per second. You can adjust these standing desk based on your height. As the standing desk has the highest holding capacity, they are little louder when compared to the other higher desks, but you could not see a best quality desk especially at this price, so noise is not going to be a matter for you. You would love the outline of the tabletop as they are developed to be beautiful, the finish is smooth and you will feel the comfort for keeping your mouse. The corners are sealed and rounded, which will provide the cool and fresh look for an extended period of time. You can go with either rectangular or contour, both of the shape desk comes with various sizes. The rectangular shape tabletop comes with various dimensions namely 30X27, 36X27, 42X27, 48X27, 60X30, 72X30, 78X30 inches. Whereas a contour tabletop comes with the dimension of 48X30, 60X30, 72X30 inches and the price range of this tabletop start from $20. If so, you will love this tabletop as they are made from the high quality bamboo and do not include any pesticides or fertilizers for the making. Bamboo is environment friendly and has grown maturity in the past few years, The tabletops are green guard certified and therefore the material they are made of does not make use of any dyes, stains etc so that there can be no harm to your health or the environment. They are many customizable options available within this Jarvis Standing Desk namely the Handset, power option, wire management and much more. Have a look at the customization options below in detail. You will be able to adjust the height as per your requirement in the available two options; there is an up, down button and an upgraded programmable handset within the product. This programmable headset is a new upgrade and cost around $35; through this, you will be able to preset the standing desk to the required standing or sitting heights. There are totally four buttons so that there is chance for second desk user to use this in your home or office. With this option, your cords can funnel through left and right sides of your desk, these wire management grommets may cost around $20 to $39. You can also choose the option of wire management bundle that comes with a surge protector, zip ties, cable trays, double sided tape etc. Each of the features can be used for the specific actions. For e.g., the double sided tape indulged in the wire management helps you to attach the trays to the desk underside. There are AC outlet grommets and two USB ports so that you can plug accurately three devices in a grommet, therefore this would be the convenient option for the phone charging. You can set one grommet for the cable management and the other one for the wire management so that you can enjoy the overall benefits in a single option. There are two options to keep your computer off the floor so that you can reduce the amount of dust that get inside, apart from that, helps in floor space free up and provide a better look to the standing desk. Among the two, one is the Ergo Depot which cost around $59 and is capable of holding larger machines. This is available in two colors namely silver and black. The other option is the Buddy which cost around $69 that holds the CPU machines with the dimension of 2.25 – 4.75 inches and 9 – 16.25 inches tall. The maximum weight it can hold is up to 22 lbs and is powerful for the 360 degree Swivel. This option will be the best suit if you are tall and you will be able to adjust 2 inches more, the price range of this would be $29. This tray is capable of holding small quantity of items and would cost around $29. The cabinet comes with three drawers, a pencil drawer, 5 rolling casters, box drawer and a hanging files drawers, Every section has the lock , the sidekick can be painted white, gray or black as per the Jarvis frame you have chosen. There is an articulating monitor arm, laptop tray (optional) and dual monitor arms, comes with various colors namely gray, white and black to match your desk frame. Why monitor arm is considered to be the ergonomic option? As you will be able to fit the monitor at the right angle while sitting or standing, you can reduce the strain over the upper back and neck. Having two monitor means you can increase the information quantity you have access to, this can be best for the video editors, traders, designers etc if you are going to use this as a laptop then you can have three screens as overall. Considering the overall sections, Jarvis is considered to be the competitive standing desk and this falls to be our favorite standing desks when compared to other desks we have reviewed before. Any ideas, thoughts and queries on the Jarvis Standing Desk are welcome!